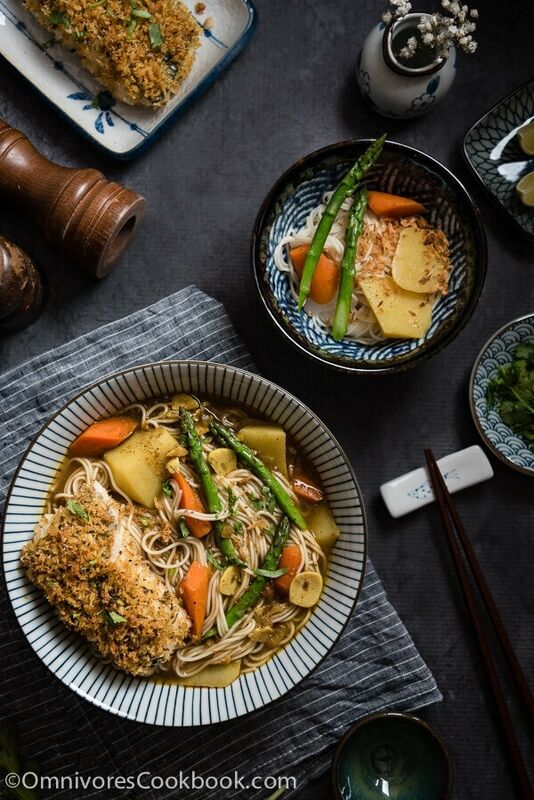 This fish curry noodle soup is an easy, fast, and flexible one-dish meal. The fish is “fried” in the oven until crispy and flaky. 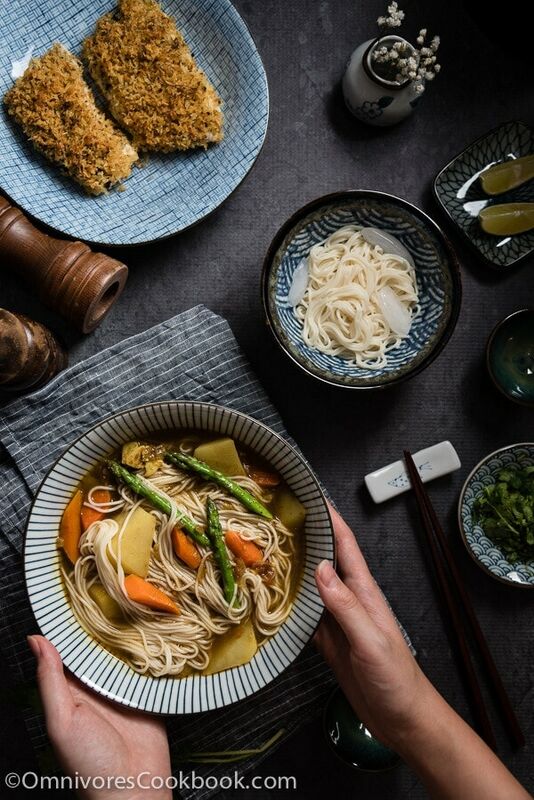 It is placed atop a hearty curry noodle soup cooked with colorful veggies. 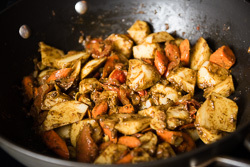 You can use this recipe to create your own version of fish curry, too! The last time we had dinner at Takashi, a Michelin one-star restaurant in Chicago (now closed), our minds were blown by a wonderful curry noodle soup paired with a glass of Spanish dry red. The soup was served cold, with a few somen noodles, mushrooms, and snow peas, in a rich dashi curry broth. It might sound strange at first, but once we had a sip of the soup and then the wine, we found everything went together perfectly like magic. It was one of the best curry noodle soups I ever had. When I was trying to come up with dinner the other day, I suddenly thought about the curry noodle soup. We still had these frozen fish fillets. They would be really tasty served with a bowl of curry noodle soup. 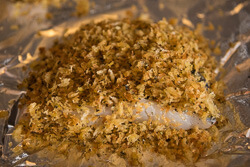 I learned a baked fish recipe from Whole Foods: the fish is coated with toasted panko breadcrumbs, olive oil, and herbs, and then roasted in the oven. By using this method, you can create a great tasting fried fish fillet with minimal oil in only 15 minutes. I made a very simple curry broth, with onion and tomato as a base, and a few drops of fish sauce to add flavor. I added potato, carrot, and asparagus to make it a nourishing meal. After a brief boil, I added noodles and topped with the crispy fish. We paired it with sparkling wine. It was a perfect meal! The crunchy crispy fish coating absorbed a bit of curry broth, and it made the fish taste even richer. The curry broth was so hearty and flavorful alongside the veggies and noodles. 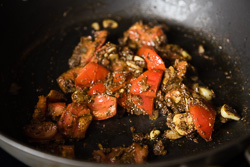 The ingredient list below probably seems long, but this is a very flexible dish and you can tweak it to fit your taste buds or whatever ingredients you have on hand. You can change the veggies to include broccoli, mushrooms, peas, cabbage, or green beans. Replace the water with chicken stock, so you can use fewer ingredients and less time to create a rich broth. 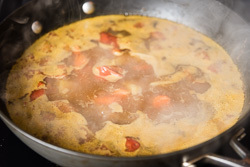 To make curry soup into a stew, skip the noodles, add less water, and boil it a bit longer. You can serve the fish with the curry stew as a side, with or without rice. 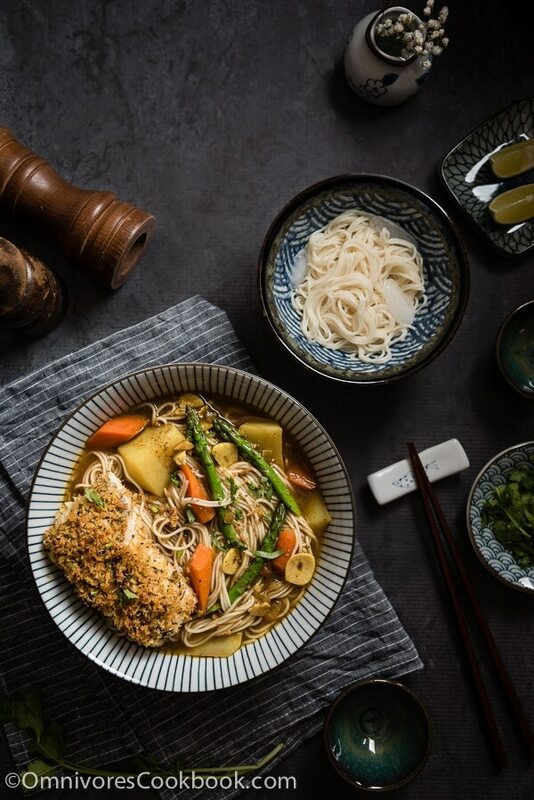 To cook this dish even faster, replace water with chicken stock and boil the noodles in the stock instead of a separate pot. Make sure there is enough soup before adding noodles (add hot water if there isn’t). The noodles will soak up a lot of liquid during boiling and make a soup into a stew. Serve the dish cold. It is very delicious that way, as well. I hope you enjoy this dish! If you make this recipe, don’t forget to take a picture and tag it #omnivorescookbook on Instagram. I love seeing your photos! 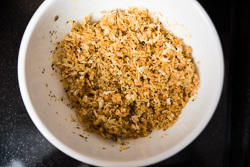 Spread panko breadcrumbs on a baking sheet and place into oven. Preheat the oven to 425 degrees F (220 C). Toast bread crumbs while the oven preheats, until breadcrumbs are lightly golden, 5 to 6 minutes. Stir once during baking, and watch closely so the breadcrumbs don’t get burned. While preheating the oven,combine lemon zest, oil, basil, salt, and pepper in a bowl. 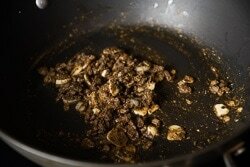 Add toasted bread crumbs and mix well. Spray a thin layer of oil onto a baking sheet. While baking the fish, heat oil in a large skillet over medium heat until warm. 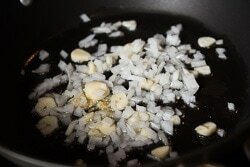 Add ginger, garlic and onion. Stir fry for 2 minutes, or until the onion turns soft. Add curry powder. Cook and stir until the onion is evenly coated, about 1 minute. Add tomato. Cook and chop until it turns soft. Add potato and carrot. Cook and stir for 2 minutes. Add 4 cups water and fish sauce. Turn to high heat. Cook until it reaches to a boil. Turn to medium or medium low heat. Simmer until the vegetables are cooked through, about 20 minutes. 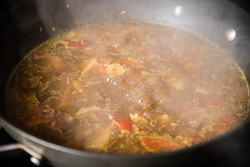 While cooking the curry broth, heat a big pot of water over high heat until boiling. Add noodles and cook according to instructions. Remove noodles from water and rinse with tap water. Set aside. (Optional) Blanch asparagus in the same pot for 1 minute. Drain and set aside. When the curry soup is ready, transfer broth and veggies to serving bowls. Add noodles and asparagus. Top with the oven fried fish and cilantro to garnish (if using) right before serving. This recipe does not call for a special curry powder. I found that mixing two to three different curry powders enhances the flavor, so I blend the ones I have in the kitchen. Because this dish contains a lot of potatoes, 1 and 1/2 bundles noodles were just enough for two of us. Reduce the amount to 1 bundle if you want a lighter dish. 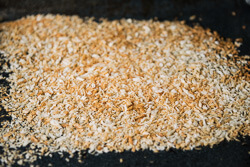 If you have leftover breadcrumbs, do not throw them away! Sprinkle them on the noodle soup. It’s really tasty! 2. The sodium content for somen noodles were wrong. The app says somen noodles contains 670mg sodium per serving (crazy). I checked the back of the package I used, it only contains 120mg per bundle (usually 1 or 1.5 bundle is enough for my husband and I). 3. The app say bread crumbs contain 207mg sodium per serving, which is correct for average plain bread crumbs. But panko bread crumbs contain less sodium, only 50mg per serving. I haven’t got to update the nutrition information yet, but the total sodium content should be definitely lower than this (the 1 tsp fish sauce does contain 400mg sodium, quite a lot). Sorry I didn’t look at this carefully before publishing. Thanks for checking on that and that makes more sense to me !!! 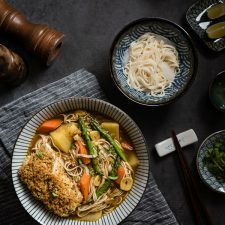 I will definitely try this with a lower sodium fish sauce or less fish sauce – I KNOW IT WILL BE DELISH…. Great! Happy cooking and hope the dish turns out delicious 🙂 Have a nice weekend! As usual, this looks and sounds gorgeous, Maggie. Your husband is a very lucky man! I can’t imagine a cold noodle soup, but I know it would be delicious if you say so! Wha wha whattt?? Love it! I’m going to just help myself with some. 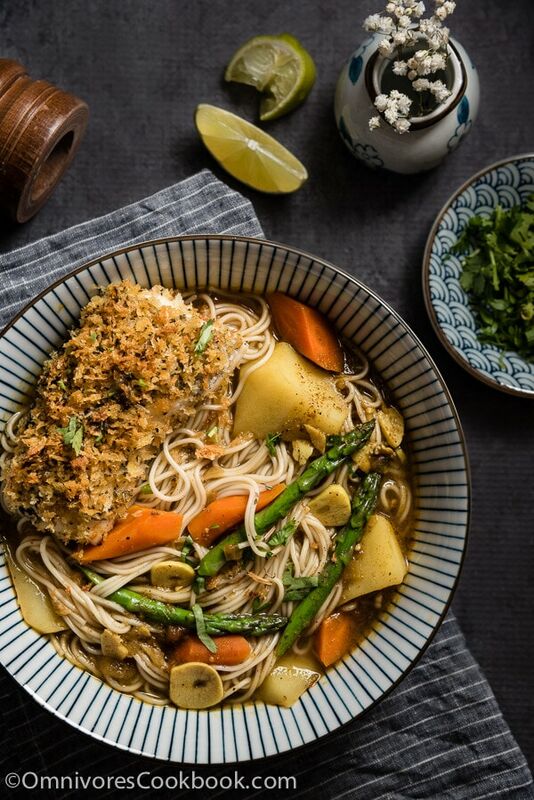 This looks like such a healthy and delicious dinner – soup is so comforting and I love how you have used crumbed fish and sautéed vegetables for lots of flavour. That asparagus looks gorgeous too! It was a chilly day here today. I sure could use a a big bowl of this awesome soup now. The flavors are just spectacular! Especially that fish, fried taste but oven baked….yes! Ummm, that curry noodle soup sounds fantastic! What a great comfort food for this fall!! Wow, Maggie, your pics are GORGEOUS!! A real feast for the eyes!